Spring is definitely in the air in the valley where I live! Today was mostly sunny and about 70 degrees, but tomorrow we will go back to April showers. That's the way it is with spring. That's also why we sometimes need bright yellow birds to remind us of sunny days ahead when life starts to rain on our parade. American goldfinch frequent my yard all year round, but during the fall and winter they are in disguise. During that time of year they molt into a drab olive and brown color. Then when spring starts to roll around again they change back into the familiar bright yellow of the males and a lovely, subtle gray green for the females. 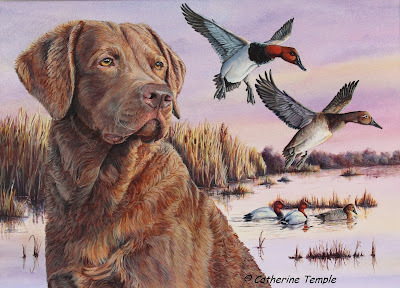 Right now the ones in my yard are somewhere in between and are kind of scruffy looking, but soon they will look just like the ones in this painting. I created this little acrylic painting for a very special sister of mine. These are some of her favorite birds and they remind me a lot of her. They are kind of clownish at times hanging from sock feeders and flowers while foraging for seeds. She's kind of clownish, too, though I've never seen her hanging upside down anywhere lately. But she does have a quirky sense of humor and can make me laugh hysterically about the silliest things when we have one of our off the wall conversations. She can definitely brighten up a day just like these beautiful birds! 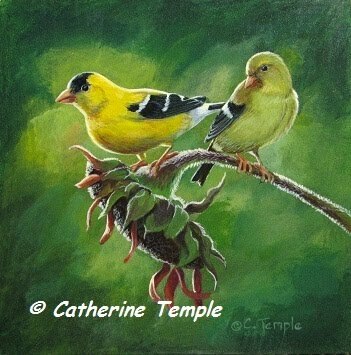 This painting already has a home, but I have created an ACEO that is available through my Etsy shop.....www.ctempleart.etsy.com. You can purchase this and many others there that would make a nice springtime gift for yourself or a friend.